Chief of Army Staff (COAS) is a 4 star General who is the Commander of the Land Army in Pakistan.Here is the list of the Army Chiefs's from the time of our Partition with India. 1. General Sir Frank Messervy. General Sir Frank Walter Messervy, KCSI, KBE, CB, DSO & Bar (1893 � 1974), was aBritish Indian Army officer in both the First and Second World Wars. Following its independence, he was the first Commander-in-Chief of Pakistan Army (15 August 1947 � 10 February 1948) Previous to this he had become a Lieutenant-General in 1945; General1947; General Officer Commanding in Chief or (GOC-in-C) Northern Command, India 1946 � 1947. General Sir Douglas David Gracey, KCB, KCIE, CBE, MC and bar (1894�1964), was aBritish Indian Army officer in both World War I and World War II. He also fought in French Indochina and was the second Commander-in-Chief of Pakistan Army. Gracey held this latter office from 11 February 1948 until his retirement on 16 January 1951. 4. Genenral Musa Khan Hazara. General Musa Khan Hazara H.Pk., HJ, HQA, MBE, IDC, psc (???? ???) (1991-1908), was the Commander in Chief of Pakistan's Army. He succeeded Field Marshal Ayub Khan, who assumed the Presidency of Pakistan. General Agha Mohammad Yahya Khan Qizilbash, H.Pk, HJ, S.Pk, psc (Urdu: ??? ???? ???? ??? ; February 4, 1917 � August 10, 1980) was the third President of Pakistan from 1969 to 1971, following the resignation of Ayub Khan. He had one son, Ali Yahya and one daughter, Yasmeen Khan. Gul Hassan Khan served as Pakistan's Army Chief of Staff from December 20, 1971 � March 3, 1972. General Tikka Khan, HJ, HQA, SPk, (Punjabi, Urdu: ??? ??? ; July 7, 1915 - March 28, 2002) was a senior 4-star general in the Pakistan Army who served as the first Chief of Army Staffof the Pakistan Army from 3 March 1972 to 1 March 1976. Before his 4 star assignment, Khan was a Martial Law Administrator of erstwhile East-Pakistan (later, Bangladesh). He succeeded Brigadier-General Mitty Masud, and assumed the command of Eastern Military High Command on March 26, 1971. As a Commander of Eastern Command, (then) Lieutenant-General Tikka Khan was the architect and top planner of Operation Searchlight. He was internationally called the Butcher of Bengal for his ruthlessness against separatists in what became Bangladesh. General Muhammad Zia-ul-Haq (Punjabi, Urdu: ???? ???? ????) (b. 12. August 1924�17 August 1988) was the sixth President of Pakistan from July 1977 to his death in August 1988. Distinguished by his role in the Black September in Jordan military operation in 1970, he was appointed Chief of Army Staff in 1976. After widespread civil disorder, he overthrew ruling Prime Minister Zulfikar Ali Bhutto in a bloodless coup d'�tat on 5 July 1977 and became the state's third ruler to impose martial law. He initially ruled as Chief Martial Law Administrator, but later installed himself as the President of Pakistan in September 1978. General Mirza Aslam Beg, SBt, HI(M), NI(M), afwc, psc (Urdu: ???? ???? ???) (born 2 August 1931), is a retired four star rank general who was the Chief of Army Staff of the Pakistan Army succeeding General Muhammad Zia-ul-Haq, after the latter died in an air crash on 17 August 1988. He continued to hold the powerful post of Army Chief till 1991, when his political ambitions forced the then President Ghulam Ishaq Khan to nominate General Asif Nawaz as the new Army chief three months prior to Gen Beg�s retirement. As Army chief, Beg is credited for improving the fighting capabilities of the Pakistan Army. General Asif Nawaz Janjua, NI(M), HI(M), SBt (Bar), afwc, psc (3 January 1937 - 8 January 1993), was a senior 4 star general and the 10th Chief of Army Staff of the Pakistan Armyfrom August 16, 1991 till January 8, 1993. His tenure was cut short by his death after suffering a heart attack. His career highlights featured successful pacification operation inSindh when the province wilted under the most violent period in its history. He also stayed as Corps Commander Karachi and Chief of General Staff before becoming the COAS. General Abdul Waheed Kakar, NI(M), HI(M), SBt, afwc, fsc(c) (born 20 March 1937), was the Chief of Army Staff of the Pakistan Army from 12 January 1993 to 12 January 1996. He was appointed to that position after the sudden death of former General Asif Nawaz, although there were four generals with more seniority. As the political climate of the country simmered during his tenure, Kakar pressured both the President Ghulam Ishaq Khan and Prime Minister Nawaz Sharif into resigning, thus precipitating in the 1993 general elections. Jehangir Karamat, NI(M), TBt, afwc, psc, fsc(u), (Urdu: ??????? ?????) (born 20 February 1941) is a retired 4 star general and a former Chief of Army Staff of the Pakistan Army from January 1996 to October 1998 and a former Pakistan Ambassador to the United States from November 2004 to June 2006. He is also one of very few Army chiefs to have resigned over a disagreement with the civilian authorities. Pervez Musharraf (Urdu: ????? ??? 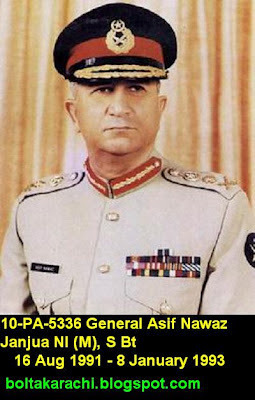 ?, born 11 August 1943) was Pakistan's Army Chiefand 10th President. He led an administrative military government from October 1999 till August 2007. He ruled Pakistan as Chief Executive from 1999�2001 and as President from 2001-08. In the face of likely impeachment, he resigned on 18 August 2008. General Ashfaq Parvez Kayani, NI(M), HI (Urdu: ????? ????? ????? , born April 1952) is a four star general in the Pakistan Army, and the current Chief of Army Staff of the Pakistan Army. 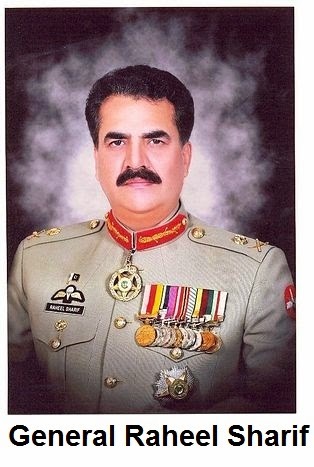 He replaced General Pervez Musharraf as the Chief of Army Staff and the commandant of the army on November 29, 2007. General Kayani is the former Director General of Pakistan'sInter-Services Intelligence (ISI), and Director General of Military Operations (MO). On 24 July 2010, prime minister Yousaf Raza Gillani extended General Ashfaq Parvez Kayani�s term as Chief of the Army Staff by three years, making him the first Pakistani four star general to receive a term extension from any democratic government. In 2008, Newsweek named him the 20th most powerful person in the world.